Can you believe that Valentine’s Day is in a couple of weeks??? If you’re like me and already starting to plan your Valentine’s Day look, then look no further! 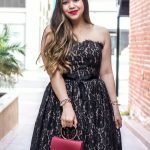 Over the next few weeks, I will be showcasing several different Valentine’s Day looks that you can recreate for this special occasion! You guys were SO obsessed with this budget-friendly self portrait azalea inspired dress from almost two years ago that I decided to get the exact same dress in red! This dress is seriously such a classic red dress that EVERYONE needs in their lives! I’m not even kidding when I say that this red lace dress would look good on everyone! It’s so universally flattering on and the intricate lace detailing is just absolutely darling! 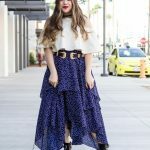 It’s only $40 and also comes in mint green and periwinkle blue (which I’ve styled in this post). For reference, I’m wearing a medium. 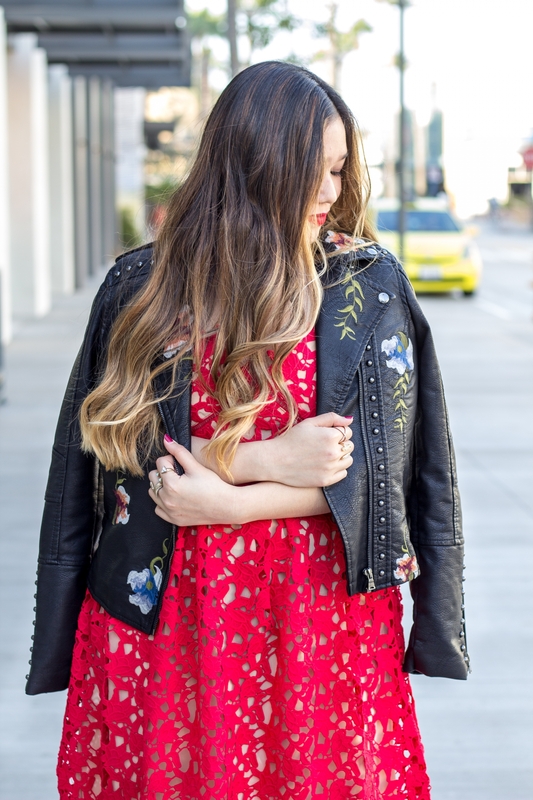 Because it tends to get cold during date nights, I decided to pair this red lace dress with the most gorgeous studded embroidered moto jacket that I’ve ever laid eyes on! I first saw this studded embroidered moto jacket by a brand that I absolutely ADORE but can’t afford (well, I guess I can afford, but I just can never justify paying that much money for a piece of clothing because I’m all about the affordable finds). So when I saw the budget-friendly version of that jacket, you betcha I snagged it SO quick, ha!! This budget-friendly version of the studded embroidered moto jacket looks IDENTICAL but for a fraction of the price – It’s only $45 and also comes in a gorgeous cream color. For reference, I’m wearing a medium! I don’t know about you, but I’m OBSESSED with this moto jacket! The studs and floral embroidery is seriously AHMAZING! Plus, when paired with this darling red lace dress, it’s seriously the PERFECT Valentine’s Day look! You’ll be turning heads alllllll night with this showstopper Valentine’s Day look!